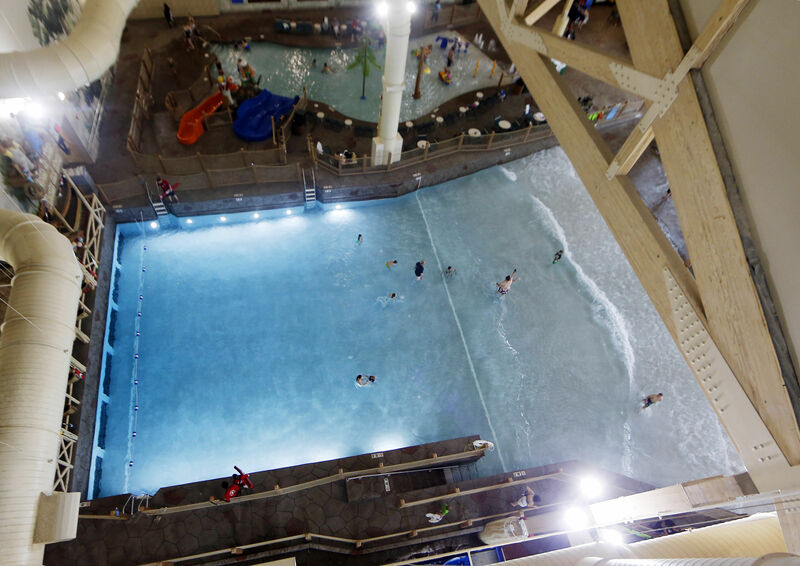 Sky high view of Great Wolf New England indoor waterpark. Bringing the number of indoor waterpark resorts to a full dozen, Great Wolf Lodge New England opened in June 2014, catering to Massachusetts, Connecticut and northern families. In keeping with tradition, they’ve brought a huge water play zone plus Northwoods log construction, bears and wolves to remote Fitchburg, Massachusetts. At their latest hotel, the Great Wolf chain has added more amenities, more organized kids activities, and larger family suites to entice multigenerational families to stay even longer. Although very similar to their other indoor waterpark resorts, Great Wolf Lodge New England promises even better weatherproof vacations to a drive-to market hungry for some guaranteed family fun year round. The most impressive configuraiton in the 406-suite resort is the expansive Grand KidCabin King Suite. It can sleep up to 10 in a combination of king and queen beds, sofabeds and the KidCabin’s bunk beds, and has two bathrooms and a private bedroom for the Mamma and Papa Bear who want peace and quiet. There are some amazing outdoor waterparks in North America that provide chilling thrills all summer long. But when we saw waterslides going into every resort pool back in the late 90s, it was hard to understand why families would pay for a day out at a local waterpark. At Great Wolf Lodge, however, indoor waterparks have kept up with the competition in this very hot segment of the amusement park industry. The 68,000-square-foot waterpark, maintained at 84-degree F so your kids won’t get cold, wraps around signature coasters such as the six-story, Howlin’ Tornado. For extra New England thrills, the first-ever Wolf Tail waterslide drops riders straight down 20 feet before sending them out on a full 360-degree loop. There’s a big zero-entry wave pool and the River Canyon Run family raft ride designed for adults to bring tiny travelers (in life jackets of course). There are toddler play areas, hot tub, lazy river, a dump bucket and wet climbing areas, all supervised by attentive lifeguards. What there isn’t is an outdoor pool — a small outdoor splash pad is open Memorial Day to Labor Day — but you can consider that an easy way to avoid putting sunblock on the kids. In New England, there’s a more extensive dry play area with an indoor mini golf course, large video arcade, the MagicQuest laser-powered scavenger hunt, a kid-oriented Scoops Spa with ice cream themed facials and mani/pedis, a mini bowling alley, and climbing equipment. Now that waterslides are almost ubiquitous, many land-based hotels and even cruise ships have added ziplines to their activity roster. The first ever Great Wolf Lodge zipline, the 30-foot-tall Howlers Peak Ropes Course in New England, provides harnessed guests a chance to traverse rope pathways with challenges at each rest station. Best yet, there’s a parallel ropes course designed for young children who can walk alongside their parents. Fine cuisine was not a hallmark at Great Wolf at our last visit, so we are pleased to see a Dunkin Donuts franchise joining a grill, pizza parlor and snack shops at this new resort. Families staying more than a night may want to stock up and use the refrigerator, microwave and coffeemaker available n each of the suites. If you’re traveling with grandparents, they’ll love being able to take their cubs down to the lobby – pajamas welcome – for the nightly Forest Friends Show and Story Time. Keep your eyes on the woodland creatures decorating the timbers all around. According to a spokesperson, more than 42 million families with children live within 300 miles of a Great Wolf Lodge, so don’t limit yourself to New England. Other resorts include the Poconos, Pennsylvania; Concord, North Carolina; Traverse City, Michigan; Wisconsin Dells, Wisconsin; Sandusky and Mason, Ohio; Kansas City, Kansas; Williamsburg, Virginia; Grapevine, Texas; Grand Mound, Washington; and Niagara Falls, Ontario, Canada. For more information and reservations (even overnight birthday parties, a real kid-pleaser), visit their site at Great Wolf.com. You can also call 866/670-9653 to ask about current specials as the room and waterpark pass prices add up quickly.